Derry City striker, Ronan Curtis played his final match for the club at Brandywell before his move to Portsmouth next week as Sligo clinched a comfortable win. THERE WAS no fond farewell for Portsmouth bound, Ronan Curtis who played his last match at Brandywell Stadium before departing for Fratton Park next week as Derry City slumped to defeat to Sligo Rovers. 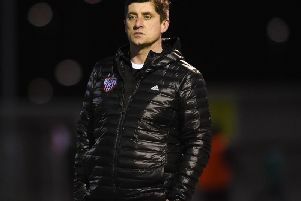 Curtis, who led the line on his final home match for the Candy Stripes in the absence of the suspended, Rory Patterson, was left frustrated as the Bit O'Red fully deserved victory. David Cawley had put the visitors ahead on 11 minutes when he raced onto Rhy McCabe's ball over the top, rounded Gerard Doherty and slotted into the empty net. And Lewis Morrison doubled Sligo's lead three minutes after the break with a clinical finish - his first senior strike! It was a first win in six league games for Sligo and a fourth defeat in their last five league matches for a struggling City side. It was a cagey opening to the game and the first shot arrived on seven minutes when Ronan Hale picked up the loose ball on the edge of the Sligo penalty area and tried his luck on the volley, but it sailed harmlessly over. Rory Hale spread the play wide on the right to McDermott who fired his first time shot narrowly wide of the far post with Sligo keeper, Mitchell Beeny scrambling across his goalmouth on eight minutes. However, it was the visitors hit the front on 11 minutes following Rhys McCabe's sublime ball over the top of the Derry defence which sent Cawley clean through. And the midfielder showed great composure to side-step Gerard Doherty and slot into the empty net from seven yards. Sligo boss, Gerard Lyttle was forced into a change when Garry Boylan was stretchered off with an ankle injury and he was replaced by Rafa Cretaro who slotted in at right back. The Bit 'O'Red were gifted a free shot on goal on 26 minutes when Lewis Morrison drifted past Peers inside the Derry 18 yard box, cut inside on his right foot before blasting over the bar. Ronan Hale almost capitalised from a long punt upfield on 34 minutes as Ben Doherty flicked the ball into his path but the Birmingham City loanee failed to get a clean connection and his shot was parried clear by Beeney. Sligo finished the half strongly and ex-City defender, Seamus Sharkey headed narrowly over from McCabe's cross. Ronan Hale was sent clear in the final minute of the half but he cut inside on his right foot and his shot was comfortably saved by Beeney. Derry made a bright start to the second half and from a corner kick Peers' header was flicked over the bar. However, Sligo doubled their advantage three minutes after the restart when McAleer's cross found Morrison who clinically found the net from six yards for his first senior goal. Adam Wixted drifted past three Derry defenders but Doherty made himself big to save at close quarters before gathering the ball at the second attempt. Doherty came close with a blistering strike from 25 yards which was deflected behind as Derry attempted to get back in the game. Substitute, Greg Moorhouse almost added a third in stoppage time after a quick counter attack but sent his shot across the face of the goal and wide of the far post. Darren Cole did flash a shot wide late on but it was a hugely frustrating night for the Candystripes. Derry City: G. Doherty; C. McDermott (J. McDonagh 64), D. Cole, G. Peers, J. Doyle (E. Toal 81); R. Hale, N. Low, Rory Hale (C. Farren 68), B. Doherty; A. McEneff; R. Curtis; Subs Not Used - E. Grimes, N. Logue, J. McIntrye, A. Delap. Sligo Rovers: M. Beeney; G. Boylan (R. Cretaro 17), K. McFadden, S. Sharkey, P. McClean; C. McAleer, R. McCabe, D. Cawley, A. Wixted; A. Roy ( G. Moorhouse 62), L. Morrison ( E. Pincelli 69); Subs Not Used - E. McGinty, L. Kerrigan, N Morahan, D. Collins.